Alpaca Socks are great accessories for all types of cold weather. They can be worn on mild winter days at home or during a mountain climbing trip. 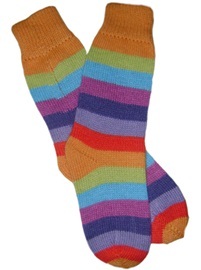 AlpacaMall.com offers a variety of alpaca socks including plain classic socks as well as hand woven Andean socks. All of our accessories are manufactured under high quality standards. Our alpaca socks use selected alpaca wool, and are woven by small to medium shops as well as artisans. Alpaca Mall offers alpaca products direct from the manufacturers, with savings for our customers and better prices for the small artisans. The use of alpaca accessories is very common in the Andean region (the original of Alpacas), spreading all over the world in recent years due to the fantastic properties of alpaca wool. Alpaca wool is both warm and light. It is one of a few natural hypoallergenic fibers and thus can be worn by people with delicate skin. Alpaca Socks come in a large variety of colors including browns, black, white and multiple combinations of the basic colors. The socks are also offered in different thicknesses. Our site carries both alpaca socks and alpaca legwarmers. Keep checking our site for deals on alpaca socks and alpaca accessories.